Abell, Felin and Foss argue that “macro-explanations” in strategic management, explanations in which organizational routines figure prominently and in which both the explanandum and explanans are at the macro-level, are necessarily incomplete. They take a diagram (which has the form of a trapezoid) from Coleman, Foundations of Social Theory, The Belknap Press of Harvard University Press, Cambridge (Mass. )/London, (1990) to task to show that causal chains connecting two macro-phenomena always involve “macro-to-micro” and “micro-to-macro” links, links that macro-explanations allegedly fail to recognize. Their plea for micro-foundations in strategic management is meant to shed light on these “missing links”. The paper argues that while there are good reasons for providing micro-foundations, Abell, Felin and Foss’s causal incompleteness argument is not one of them. Their argument does not sufficiently distinguish between causal and constitutive relations. Once these relations are carefully distinguished, it follows that Coleman’s diagram has to be squared. This in turn allows us to see that macro-explanations need not be incomplete. Thanks go to the participants of the “Reduction and the Special Sciences” Conference (TiLPS, Tilburg, 10–12 April 2008) and to two anonymous referees for useful comments and suggestions. The usual disclaimer applies. In a series of joint papers (Felin and Foss 2005, 2006; Abell et al. 2008; Felin and Hesterly 2007),1 Teppo Felin and Nicolai J. Foss recently launched a microfoundations project in the field of strategic management. Felin and Foss argue that extant explanations in strategic management are predominantly macro-explanations. In these explanations, routines and organizational capabilities, which are taken to be properties of firms rather than of individual persons, figure prominently. Routines and organizational capabilities sometimes are explananda in explanations (e.g., when they are seen as outcomes of organizational learning). At other times they are explanantia in explanations (e.g., when firm behavior and firm performance are seen as outcomes of routines or capabilities that are in operation). In both cases the explanations remain at the macro-level: phenomena at the macro-level are explained in terms of other phenomena at the macro-level. The explanations do not refer to what individual interactions are taking place at the underlying micro-level. This is a significant deficiency of the explanations, Felin and Foss argue, for it is clear that individual agents and their actions and interactions play a crucial, indispensable causal role not only in how routines and organizational capabilities originate in the first place, in how they are subsequently maintained, revised or replaced, but also in how routines and organizational capabilities affect firm behavior and firm performance. Felin and Foss’s microfoundations project is meant to repair this deficiency: more attention should be paid to exactly how individual agents and their actions and interactions are involved in the emergence and functioning of routines. I sympathize with Felin and Foss’s plea for providing micro-foundations in the field of strategic management. Elsewhere (Vromen 2006), I also argued that more work is needed on how exactly routines function at the micro-level. Such micro-analyses can not only deepen our understanding of how routines work. They also can help us in sorting out which of the many features that are ascribed to routines in the literature are warranted. I disagree, however, with the way in which Felin and Foss make their case. The main argument that Felin and Foss put forward is that macro-explanations are deficient because they are incomplete. They are incomplete, Felin and Foss argue, in that they miss out on crucial links in the causal chain connecting macro-phenomena, links that operate via the micro-level. I argue that this argument is flawed. It is based on a doubtful if not outright incorrect use of Coleman’s diagram. Coleman’s diagram has the shape of a trapezoid. In a sense to be explained below, only if Coleman’s diagram is squared it can account for the relations between routines, individual action and interaction and firm behavior and firm performance in an accurate way. Once Coleman’s diagram is squared, one can see why and how macro-explanations need not miss out on any link in the causal chains that connect macro phenomena. Micro-analyses are still needed, but not to account for causal links that macro-explanations miss out on. Abell et al. (2008) observe that the explanations invoking routines and organizational capabilities given in organization science, and in strategic management in particular, are predominantly collectivist or macro-explanations. Whether routines and organizational capabilities are the explananda or explanantia in explanations, most extant explanations in strategic management stay at the collective or macro-level. Such explanations do not address what happens underneath, at the individual or micro-level. And yet, Abell et al. argue, it is at the level of individual action and interaction where most of the causal action is. The prevailing macro-explanations in strategic management thus are incomplete: they fail to refer to crucial parts in the causal chain. At best, macro-explanations are useful convenient shorthand or reduced form explanations that do not highlight causal relations. Although Nelson and Winter (1982) were not the first to write about routines and organizational capabilities, much in the current literature on routines and organizational capabilities can be traced back to Nelson and Winter’s seminal work. Nelson and Winter argue that understanding a firm’s routines provides the key to understanding the firm’s behavior. As Abell et al. rightly remark, much is packed into Nelson and Winter’s notion of a routine. Among other things it refers to the standard operating procedures that are followed within firms by units (and by the individuals in them) when they are presented with familiar recurrent tasks. In more abstract and general terms, following Nelson and Winter’s discussion of routines (which Nelson and Winter define as “… a capability for a smooth sequence of coordinated behavior that is ordinarily effective relative to its objectives, given the context in which it normally occurs”, Nelson and Winter 1982, p. 73), Abell et al. describe routines as organization-specific repetitive interactions within the entire organization that are typically patterned in fixed sequences of individual action (Abell et al. 2008, p. 493). More will be said about routines below. For the moment, let it suffice to say that what makes routines macro- rather than micro-phenomena is that they are taken to be properties of firms rather than of individual persons. It is firms, as multi-person organizations, not individual persons, that do or do not have routines. As Abell et al. correctly note, Nelson and Winter developed their notion of a routine with an eye on building an evolutionary theory that would be rival to what they called orthodox economic theory with respect to explaining and predicting outcomes at the levels of the industry and of the whole economy. Outcomes at the levels of the industry and of the whole economy are perhaps more readily associated with macro- or collective phenomena than properties of the firms that make up industries and economies.2 But properties of firms, although they are to be situated at one level below that of industries, can also be called macro-phenomena in that they are situated above the micro-level of persons. If, as Abell et al. do, the micro-level is identified as the level at which persons act and interact with each other, then all phenomena at higher levels of organization (or aggregation) can be called macro-phenomena. As indicated above, routines figure in macro-explanations in strategic management both as explananda and as explanantia. Routines are explananda in attempts to explain the origin or emergence of routines. Abell et al. argue that typically no sustained attempt is made to analyze rigorously how and why the actions taken by different individuals in an organizational setting come to mesh into orderly and repetitive patterns. That is, no micro-explanation of the emergence of routines is forthcoming. Yet it is perfectly clear that routines originate from the actions taken by different individuals. Instead, most explanations are macro in that they treat new (first-order) routines as the outcomes of organizational (as opposed to individual) learning guided by (second-order) search routines. Routines are (part of the) explanantia in attempts to explain the differential behavior and performance of firms. Differences in behavior and performance among firms are explained by referring to the differences between the routines that the firms have. It is assumed in such macro-explanations that routines are a direct cause of firm behavior and of firm performance. Abell et al. (2008, p. 494) adapt Coleman’s diagram as follows to illustrate what is missing in macro-explanations in strategic management: Open image in new window The left trapezoid is meant to depict explanations of routines (when routines are the explananda) and the right trapezoid is meant to depict explanations of firm-level outcomes in which routines figure as (possibly part of the) explanantia. Macro-explanations are understood by Abell et al. as explanations that refer only to macro (or collectivist) entities and properties. Both the explanandum and the explanans of macro explanations are located at the macro-level. And the mechanisms linking the explanans and the explanandum in macro-explanation are taken to be macro-level mechanisms. In the figure, the macro-explanations are denoted by arrows 4 and 4a. Arrow 4 stands for the macro-level mechanism that allegedly links macro-antecedents for routines (such as initial conditions for organizational learning) to the emergence of new routines. Arrow 4a stands for the macro-level mechanism that allegedly links routines, once emerged, with firm-level outcomes. Now the main problem with such macro-explanations, Abell et al. argue, is that they suggest that macro-level mechanisms exist that operate solely at the macro-level, whereas the truth of the (causal) matter is that such macro-level mechanisms do not in fact exist (Abell et al. 2008, p. 491). Macro-phenomena are never causally linked to each other directly, but only indirectly, via individual (inter)actions (ibid., p. 494). Macro-explanations suggest that the causal link between macro-phenomena runs directly via a macro-level mechanism (as denoted by arrows 4 and 4a), whereas in fact the causal chain connecting them runs via individual (inter)actions. To be more precise, there are three subsequent steps in the causal chain connecting macro-phenomena that all crucially involve individuals and their (inter) actions.3 In the first step, which they call macro–micro causality (or ‘downward causation’; Felin and Foss 2006, p. 266), some macro-level cause affects how individuals (inter)act. This is denoted by arrow 1. In the second step (denoted by arrow 2), there is ongoing individual (inter)action, which, in the third step (denoted by arrow 3), gives rise to the macro-level phenomenon to be explained (‘upward causation’). Since macro-explanations fail to describe and clarify these three steps in the causal chain, they are seriously incomplete. They always fall short of tracing the actual causal chain between macro-phenomena. At best, macro-explanations present useful shorthand ‘reduced form’ explanations that describe correlations (or other statistical regularities) between macro-phenomena (ibid., p. 492). Arguing that macro-explanations are incomplete suggests that something has to be added to macro-explanations in order to get complete explanations. But it is not at all clear that Abell et al. plead for adding something to macro-explanations so as to make them more complete explanations. At times, they argue that macro-explanation should be dispensed with altogether: “Thus, in explaining collective level phenomena, reference must be made to the level of the individual. A further interpretation is that individual-level/micro explanation replaces collective level/macro explanation”(Abel et al. 2008, p. 498 – Italics in the original). And, indeed, if the aim is to provide a causal explanation of macro-phenomena that gets the causal history (or etiology) at least roughly right, such a radical conclusion seems to follow from their own discussion. Understood as an attempt to provide such a causal explanation, macro-explanation fails miserably. For macro-explanation posits macro-level mechanisms that allegedly link macro-phenomena directly with each other that Abell et al. argue do not exist at all (cf. also Hedström and Swedberg 1998, p. 24). Macro-explanations do not cover part of the causal history, they get the causal history completely wrong. Abell et al. argue that their plea for replacing macro-explanations by micro-explanations follows from their commitment to a combination of two doctrines: methodological individualism and the view that the ultimate aim of scientific endeavor in strategic management is to identify and theorize the causal mechanisms that produce macro-level regularities (Abell et al. 208, p. 492). Taken together, Abell et al. argue, the two doctrines imply that strategic management should try to uncover how individual action and interaction causally produce strategic macro-phenomena. They approvingly refer not only Elster’s (1989) and Hedström and Swedberg’s (1998) work on social mechanisms, but also to Glennan’s (1986) and Machamer et al.’s (2000) more general work on mechanisms and mechanistic explanation. Apparently Abell et al. believe that the latter literature supports their plea. In this section, I argue that this is not the case.4 The literature on mechanistic explanation does not support the view that micro-explanations are to be preferred to macro-explanations. This literature furthermore suggests that Coleman’s diagram, which as we saw has the shape of a trapezoid, should be squared. Taking a closer look at mechanistic explanation helps us in sharpening our idea of what is problematic with positing top-down causal relationships. To explain a phenomenon mechanistically is to show how it is produced by a mechanism. Several definitions of ‘mechanism’ are put forward, but what they all have in common with each other is that mechanisms consist of parts that are organized in such a way that their activities and interactions “… are productive of regular changes from start or set-up to finish or terminal conditions” (Machamer et al. 2000, p. 3). So the first thing to note about mechanisms is that at the level of analysis at which a mechanism is identified, if the mechanism starts to operate from certain initial conditions (or if it is provided with certain inputs), it regularly and reliably tends to produce certain outcomes (or outputs). Lacking such regular patterns linking certain sorts of inputs to certain outputs, there are no mechanisms in the first place. The second thing to note is that giving a mechanistic explanation implies that what happens in between a system’s start or set-up conditions and its finish or terminal conditions is not treated as a black box, but is highlighted. The way in which the mechanism’s parts behave, interact and are organized are peered into. As Craver puts it, “mechanistic explanation is inherently componential” (Craver and Bechtel 2007, p. 131). In this sense, mechanistic explanations have an inbuilt reductionist bias. In mechanistic explanation one is looking not just at what the system is doing, but also “into the system” at how it is doing what it is doing. The third thing to note about mechanisms is that they often are multilevel: they span several levels. The parts that constitute a mechanism are often mechanisms in their own right, that can be analyzed further into their parts and into how these parts are organized and interact. Mechanisms can be nested in this way. If levels are understood mechanistically, the relation between adjacent levels is a non-causal constitutive one between a whole and its parts. As Craver and Bechtel (2007) argue, several widespread beliefs about the nature of causal relationships militate against viewing inter-level constitutive relations as causal relations. First there is the widespread belief that causes and beliefs must be wholly distinct (Lewis 2000, p. 78). Wholes and there parts are clearly not wholly distinct. Another widespread belief is that causes precede effects. By contrast, the constitutive relation between parts and a whole is synchronic. It could still be maintained, of course, that it takes time for higher-level phenomena to cause changes in lower-level phenomena. But such a move would run against another widespread belief about the nature of causal relationships: that causal relationships are asymmetric. Causes produce their effects, but not vice versa. Constitutive relations are symmetric. A change in the parts manifests itself also as a change in the mechanism as a whole, and a change in the mechanism is also a change in at least one of its component parts. In short, on a mechanistic understanding of mechanisms common convictions about the nature of causal relationships preclude viewing inter-level relations as causal relations. Craver and Bechtel do not deny that there are real, genuine cases in which changes and interventions in macro-phenomena causally lead to changes in micro-phenomena. In fact, they argue that such cases abound in reality. One can think here of rather trivial and uncontroversial cases of someone pushing a cart to the corner, thereby causing the hotdogs on the cart to arrive at the corner and of someone who causes his cells to use more glucose by starting to play a tennis match. What Craver and Bechtel deny is that cases like these involve inter-level causal relations. Causal relations, they argue, are exclusively intra-level. Inter-level relations are invariably constitutive. 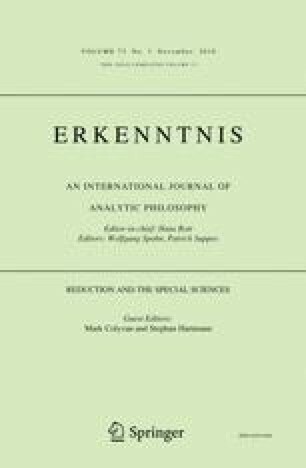 They argue that apparent cases of inter-level causal relations can be rendered fully intelligible by viewing them as what they call mechanistically mediated effects: as hybrids of constitutive relations, which are exclusively inter-level, and causal relations, which are exclusively intra-level. The dotted vertical inter-level arrows 5 and 8 stand for non-causal constitutive relations.7 Constitutive relations are synchronic. The idea is that at any point in time, macro-level mechanisms are constituted by their micro-parts and how they are organized and interact. Here, in this diagram, this is visualized only for two points in time: the start and finish conditions. But in principle this can be done for any point in time in between. Moving from the left to the right is thus meant to indicate a passing in time. The straight horizontal intra-level arrows 4, 6, 2 and 7 stand for non-constitutive causal relations. Causal relations are diachronic. The idea, to be further elaborated and defended below, is that the complete causal chain or trajectory between two macro-phenomena can be described and analyzed at both the macro-level (indicated by arrow 4) and the micro-level (indicated by arrows 6, 2 and 7). An important implication of this ‘squared diagram’ is that, contrary to what Abell et al. argue, not arrow 4 but arrows 1 and 3 stand for convenient shorthands. Arrows 1 and 3 do not stand for real causal relations. The effects of arrows 1 and 3 are not effects of inter-level causal relations, but are mechanistically mediated effects. The effect of arrow 1 is an effect of a hybrid of the constitutive relation 5 and the causal relation 6. And the effect of arrow 3 is an effect of a hybrid of the causal relation 7 and the constitutive relation 8. At this juncture, it might be objected that the real causal relations are all at the micro-level. What the foregoing might be taken to show is that arrows 6, 2 and 7, and not arrow 4, depict the complete causal trajectory. After all, is not the real causal action with individual persons and their causal powers rather than with collectives? It seems only individual persons are genuine agents, capable of changing things. Collectives such as firms, or units in them, do not seem to be capable of doing that. It is always individuals in them, or acting on behalf of them, that can set things in motion. So, Abell et al. might be wrong in arguing that arrows 1 and 3 stand for inter-level causal relations, but the foregoing discussion does not seem to undermine their plea for micro-foundations in strategic management. On the contrary, it only seems to support their plea. If arrows 6, 2 and 7 depict the real causal trajectory, then arrow 4 still does not seem to stand for a causal relationship (but, instead, for some non-causal statistical regularity). And Abell et al.’s conclusion that macro-explanation has to give way to micro-explanation would only be reinforced. This objection needs careful unpacking. The first thing to note is that a crucial assumption made in the objection is that the real causal trajectory occurs either at the macro-level or the micro-level. Mechanistic explanation, and especially the notion that mechanisms can be (and often are) multilevel, does not make this assumption. The idea in mechanistic explanation is rather that if there is indeed a macro-level mechanism, then this mechanism can be looked at both at the macro- and micro-level. In the diagram, arrows 6, 2 and 7 depict what we see if we zoom in into the mechanism and arrow 4 depicts what we will see of we zoom out.8 From the perspective of mechanistic explanation, the mistake made in the assumption is that there might in principle be two different causal processes or mechanisms at work—a macro- or a micro-process—and that only one of them can be the real one, whereas there is only one causal process or mechanism working that can be looked at at different levels. Furthermore, looking at a macro-level mechanism at the macro-level does not imply that collectives are agents with the same causal powers as individual persons. Looking at a macro-level mechanism at the macro-level is fully compatible with the view that individual persons are the only agents capable of bringing about changes. The view on mechanistic explanation defended here implies that individual persons, their causal powers and their interactions are always constitutively involved in the operation of a macro-level mechanism, regardless of the level at which we choose to look at the operation of the mechanism. This first response does not establish that there are macro-causes and macro-level causal relations, however. It might still be possible that causal powers reside fully at the micro-level. So we need an independent reason to argue for the existence of macro-causes and macro-level causal relations. In recent philosophical literature, we can readily find such a reason. Woodward (2003) put forward a widely accepted interventionist (or manipulationist) notion of causation. Central to this notion is the idea that effects depend counterfactually on their causes. Saying that X is a cause of Y is saying that if X had taken a different value than it actually took, Y would have taken a different value than it actually took. It means that if an intervention had been made on X with respect to Y, the value of Y would have changed as a consequence. If Y was just correlated with X (was not causally related to X), a change in the value of X would not have changed Y. Saying that X is a cause of Y means furthermore that the value of Y would have changed only via a route that goes through X and not in some other way. For X to be a cause of Y, the relationship between X and Y must be invariant under the intervention. The intervention should only change the value of X, not the relation between X and Y. The interventions implied need not be actually implemented and need not even be physically possible. Note that on this notion of causation, causes (and their effects) can be at any level, including the macro-level. Note also that on this understanding of causation, causation is not to be equated with agency. On a natural reading of ‘mechanism’, the mechanism is the causal chain that connects the cause X and the effect Y. In principle it is possible to know that X caused Y without knowing how exactly X brought about Y. If in addition the mechanism is known, we also know the latter. Note that on Woodward’s interventionist notion of causation the mechanism linking X and Y must be invariant under interventions. On the basis of this short discussion of causation we can conclude that there can be macro-causes and macro-level mechanisms. Macro-level mechanisms might be looked at at the macro-level. If we do so, we of course do not see what is happening underneath at the micro-level of individual interaction. But that does not imply that we necessarily miss out on parts of the causal chains that connect macro-phenomena. If we look at the causal chain connecting two macro-phenomena at the macro-level, we can in principle see the complete causal chain. The discussion so far has been rather general and abstract, however. No specific reference was made to particular macro-phenomena and particular macro-level mechanisms. Let us now return to the field of strategic management and see whether there are good reasons to regard routines as macro-causes. If we are to believe Abell et al. (2008), routines are seen as macro-causes in the prevailing macro-explanations in strategic management. At first sight, they seem to be right on this. In these explanations, differences in firm behavior and in firm performance are indeed explained by referring to the (alleged) fact that different firms have different routines. Firm performance and routines seem to display the sort of counterfactual dependence for routines to be called causes of firm performance. On closer inspection, however, routines are rather to be seen as multilevel macro-level mechanisms, causally linking particular standard inputs to particular outputs. If we can believe the properties that are attributed to routines, routines do seem to display the invariance under interventions to qualify as macro-level mechanisms. Prevailing macro-explanations of differential firm performance in terms of their different routines firms have seem to underwrite Abell et al.’s reading that routines are viewed as macro-causes. These explanations stipulate that firms behave and perform differently when faced with the same tasks because they have different routines. The routines of a firm seem to be seen as causes of the firm’s behavior and performance in the relevant counterfactual sense that if a firm had had other routines, its behavior and performance would have been different as well. Yet there seems to be something wrong in saying that routines are viewed as causes in prevailing macro-explanations in strategic management. Let us have a look again at Abell et al.’s use of Coleman’s diagram to depict how the routines of firms causally determine their behavior and performance. In this depiction, routines affect firm behavior and performance indirectly, via a causal chain that routines set in motion. This does not get the relation between the operation of routines and firm behavior and performance right. Routines do not set a causal chain in motion that eventually results in firm behavior and performance. There is no mechanism causally connecting routines to firm behavior and performance. Routines are rather the mechanisms themselves that connect the tasks that firms are faced with to their behavior and performance. Contrary to what Abell et al. argue, on a correct understanding of routines individual interactions do not causally connect the routines of firms to their performances. Individual interactions are rather crucial parts of the routines of firms that causally connect familiar tasks that firms are presented with to the behavior and performance of the firms. Abell et al. are right that the operation of routines crucially involve individual interactions. But they are wrong in suggesting that routines causally affect individual interactions. Individual interactions are involved in the operation of routines in a constitutive rather than causal way. Individuals and their interactions are crucial parts in the operation of routines. If the employees had behaved and interacted differently, there would not have been the routine in the first place. A routine of a firm is to a large extent how some of the firm’s employees behave and interact. How the employees behave and interact is what we see if we zoom in on a functioning routine. Or, as Craver puts it, we can try to give a constitutive explanation of how some routine functions by looking at how its component parts behave and interact: the working of the routine as a whole—S’s ψ-ing (or: acting entities)—is explained by the specific way in which the actions of the system’s components—X’s φ-ing—are organized. In their introduction of the notion of a routine, Nelson and Winter (1982) argue that the routines of a firm function as the skills of individual persons. Routines are like skills, Nelson and Winter argue, in that routines embody organizational (tacit) knowledge and organizational (working) memory, just as skills embody individual tacit knowledge and individual working memory. They also argue that routines are like skills in that options are typically selected automatically, that is, without awareness that a choice is being made (Nelson and Winter 1982, p. 73). Nelson and Winter’s ‘routines as skills analogy’ is contested. One of the reasons why it is contested is that firms do not seem to be the type of ‘agents’ that can select options either automatically or non-automatically. Moreover, there does not seem to be a good reason to assume that individual agents involved in the operation of routines behave automatically. The smooth functioning of a routine might entail, and even require, that the individuals involved select options in a non-automatic deliberate way. While the ‘routine as skill analogy’ is controversial, what is uncontroversial is that the operation of some particular routine crucially does involve, not in a causal, but constitutive way, specific patterns of interactions of several individual persons (cf. Vromen 2006). Absent the specific patterns of individual interactions, the routine would not have existed in the first place. Another analogy that Nelson and Winter invoke is the ‘routines as genes analogy’. This analogy is even more contested than the ‘routines as skills analogy’. What is called into question in particular is that routines can be seen as replicators in the same way as genes are seen as replicators. Are routines really like genes in that they are copied more or less faithfully when the one firm imitates another firm? It remains to be seen, however, whether Nelson and Winter had ‘high-fidelity’ copying in mind when they invoked the ‘routines as genes analogy’. It is more likely that what Nelson and Winter were looking for was a unit in economic evolution with similar longevity or durability as genes in biological evolution. Nelson and Winter claim that the routines of firms tend to be stable over time. What the routines of a firm typically do is process standard or familiar tasks (as incoming messages or inputs to a firm) in a reliable and predictable way so that there is little variation in the firm’s behavior and performance (as the output of the firm). At the top macro-level, we have the routine S as a whole, reliably and predictably linking inputs (denoted by the arrow on the left) to outputs (denoted by the arrow on the right). The middle level is what we see if we zoom in on the functioning of the routine. What becomes visible then are particular organization and interaction patterns in which entities at a lower level Xs figure. These Xs might be individual persons, in which case the middle level is the micro-level, or units or departments within the firm in question. Regardless of whether the middle level is the micro-level, we could zoom in further on the activities of the entities at the middle level. Then patterns of organization and interaction at an even lower level become visible. If the middle level is the micro-level, units Ps and Ts are subpersonal entities, such as the skills, behavioral dispositions or brains of individual persons. What the Figure nicely brings out is not only that a macro-level mechanism such as a routine is multilevel, but also that the levels involved are constitutively or componentially related to each other and that it is the same process or mechanism that can be looked at at different levels. If a firm is in routine operation, then it is legitimate to explain the firm’s behavior and performance in terms of the firm’s routines. Such macro-explanations can be complete in that they need not miss out on any part of the causal chain that links particular inputs to the firm to the firm’s behavior and performance. But are such macro-mechanisms mechanistic explanations? Mechanistic explanations, we have seen, are inherently componential. Macro-explanations of a firm’s behavior and performance in terms of its routines do not seem to be componential, however. As the above Figure suggests, the black box of the components and how they are organized is not opened if we stay at the top level. If there are several interlocked routines that go into the causal chain linking the firm’s inputs to its behavior and performance, however, macro-explanations of the firm’s behavior and performance in terms of how the firm’s routines are interlocked can be called componential and, hence, mechanistic. By zooming in on the firm’s routines and on how they are interlocked the black box of firm behavior is opened. In such a case, the top level in the above Figure could stand for the level of the firm as a whole and the middle level for how the routines Xs are organized in the firm. Macro-explanations of a firm’s behavior and performance in terms of its routines would then be componential and mechanistic. What this shows is that there is some flexibility in interpreting levels if we have several interlocked multilevel mechanisms. What it also shows, however, is that if mechanisms can be interlocked we do not seem to have clear criteria for how to individuate mechanisms. If we have interlocked routines, for example, that together make for a long causal chain connecting a firm’s inputs to the firm’s behavior and performance, then why not say that there is only one routine functioning that comprises the whole causal chain? In other words, once we settle on a view on routines as mechanisms that reliably and predictably link inputs to outputs, there seems to be some degree of arbitrariness in where to draw the boundaries of routines. What has been established thus far is that Abell et al.’s argument that macro-explanations of differential firm performance in terms of firm-specific routines are incomplete is flawed. Such macro-explanations can be complete in the sense that they need not miss out on any part in the causal chain that connects the routines of firms to the firms’ behavior and performance. What we also saw in the preceding section is that it is misleading to argue that there is a causal chain connecting the routines of firms to the firms’ behavior and performance. In a sense, routines are rather causal chains themselves that terminate in the behavior of firms. Routines are best viewed as macro-level mechanisms that directly causally connect inputs to a firm to its behavior and performance. Abell et al. are right in arguing that individuals and their interactions are crucially involved in this, but wrong in suggesting that the way in which individuals and their interactions are involved is that routines always affect firm behavior indirectly, through their effects on individual interactions. Individuals and their interactions are rather constitutively involved in the operation of routines and routines may directly result in firm behavior and performance. What is still lacking is a possible positive reason to prefer macro-explanation to micro-explanation in the field of strategic management. Mechanistic explanations are inherently componential, we saw. This does not imply that there is an inbuilt bias in the notion of mechanistic explanation privileging the micro-level of individual persons and their interactions as the level at which the components are to be located. Saying that mechanistic explanations are inherently componential does not prejudge the issues at what levels we identify mechanisms and at what levels we identify their components. For some explanatory purposes, even if we fix the level at which we identify the mechanism at the macro-level of firm behavior we might want to locate the components at the sub-personal level, for example in particular brain areas of persons. Or we might want to locate them at the intermediate level of units, departments, teams and groups within firms. And we might want to identify mechanisms at levels higher than that of firm behavior, such as industries and economies. If we do so, components of those higher-level mechanisms might be located not at the micro-level of individual persons, but at the macro-level of firms. Even though it has been established that macro-explanations should not be discarded on the ground that they are incomplete, there might still be good other reasons to prefer micro-explanation to macro-explanation. One such possible reason, that the basic causal action occurs at the micro-level of individual interaction rather than at the macro-level, we already rejected. On a reasonable interventionist notion of causation, there can be macro-causes and macro-level mechanisms that are just as genuine or real as micro-causes and micro-level mechanisms. Routines, it was argued here, are macro-level mechanisms. They are multilevel in the sense that they span several levels. If such mechanisms are operating, it does not make sense to ask whether the basic causal action occurs at the macro-level or at the micro-level. Macro and micro rather appear here as levels at which the same causal process can be described. In fact, the foregoing provides a good starting-point for finding a positive reason to prefer macro-explanation to micro-explanation: macro-explanations provide a sort of information that micro-explanation cannot possibly provide. If we are interested in answering specific sorts of contrastive questions, only macro-explanation can provide the relevant answers. If we are interested in questions such as “What would the behavior or relative performance of a firm have been if the firm had had different routines”?, or “What would the behavior or relative performance of a firm have been if the firm had been faced with other tasks and inputs”?, then macro-explanation does a better job than micro-explanation. We need to have information then about routines; information about the regularities or patterns that link tasks and inputs to firms to their behavior and relative performances. By focusing on individuals and how they interact at the micro-level, such regularities or patterns would elude us. It is widely assumed in the literature that routines do display the stability or invariance over time needed to answer such contrastive questions. Nelson and Winter (1982) argue that the stability of routines is at least partly due to the fact that routines function as truces in organization. It is argued that routines see to it that frictions and clashes between employees in firms are suppressed and reduced to a minimum, even though the employees’ interests are at least partly conflicting. Nelson and Winter’s argument is sketchy and not worked out in great detail. The same holds for their even stronger claim that routines even tend to survive personnel turnover (Nelson and Winter 1982; Levitt and March 1988; Kogut and Zander 1992). The idea is that existing routines tend to remain unaltered even if employees are replaced by new ones. Whether or not routines of firms actually do display this strong degree of robustness (or resilience) is an empirical question that cannot be settled on purely a priori theoretical grounds. Assume, for the sake of argument, that further empirical research points out that there are indeed routines that display this strong degree of robustness. Then we might still want to know when, under what circumstances, and why routines tend to display such strong degree of robustness. The explanation sought for would be a micro-explanation. The challenge would be to explain first why, despite the partly conflicting interests of employees, ‘routines as truces’ would emerge in the first place and second why such routines tend to survive replacements of personnel. Evolutionary game theoretic analyses of the spontaneous evolution of conventions and institutions (e.g. Sugden 1986; Young 1998) seem to be a promising avenue of research here. The idea here is that in learning processes, individuals converge on a Nash equilibrium (or some sort of evolutionarily stable strategy), that withstand unilateral deviations from it. Thus, if some new employee is hired, he might not immediately fit in with the existing routine. As a consequence, there will be a disruption of the routine. But if the routine is a Nash equilibrium, the employee will find out that his interests are served better by playing his part in the routine. Thus the routine will be restored. Abell et al. (2008) put forward an interesting micro-explanation of routines along these lines. I agree with them that there is a need for such micro-explanations in the field of strategic management. There is much about routines and firm behavior that we only understand dimly. For answering some specific questions about them, micro-explanations might be better suited than macro-explanations. But, as we saw above, Abell et al. want to make a much stronger case for ‘micro-foundations’ in strategic management than this. Abell et al. argue that macro-explanations are to be replaced by micro-explanations altogether, independently of whatever explanatory question we might want to answer. It is only this latter stronger claim that I find fault with. If it turns out to be true that routines do display considerable stability over time, this information can be used in macro-explanations to answer contrastive questions that micro-explanation cannot answer. One of the arguments that Abell et al. put forward to support their plea for micro-foundations is that micro-explanations in terms if the actions and orientations of individual persons are likely to be more stable and general than macro-explanations (Abell et al. 2008, pp. 492–493). What they mean by this is not entirely clear. But if they mean that micro-mechanisms, the behavioral characteristics of individual persons that link the conditions to behavior, are more stable than macro-level regularities, then their argument is questionable. If indeed routines are robust against personnel turnover,11 then it seems there might be greater stability at the macro-level than at the micro-level. Individual employees with possibly different behavioral characteristics might come and go, while routines remain the same. More generally, experimental findings strongly suggest that individual behavior is highly context-dependent. This implies that invariance in micro-mechanisms might be hard to come by (Steel 2006). At the very least, Abell et al. owe us more clarification and empirical evidence to make their argument more convincing. A related argument put forward by Abell et al. is that macro-explanation might be consistent with various alternative micro-explanations of macro-behavior (ibid., p. 492). It is understandable why Abell et al. see this as a shortcoming of macro-explanation. If the ultimate aim in strategic management is to give causal mechanistic explanation, and if causality always runs via individual interactions at the micro-level, as Abell et al. believe, then it is mandatory to identify the one true micro-explanation. But once we give up the second condition, and realize that macro-phenomena are mechanistically realized in micro-phenomena, we can turn Abell et al.’s argument on its head. The argument then can be used to legitimize the autonomy of macro-explanation. For Abell et al.’s observation that macro-explanation is consistent with various alternative micro-explanations can then be read as implying that macro-phenomena are multiply realized in micro-phenomena. This implication is often used as an argument for the autonomy and legitimacy for higher-level explanations. The upshot is that Abell et al.’s arguments discussed here fail to show that micro-explanation is to be preferred to macro-explanation.12 For some explanatory purposes macro-explanation might be preferred to micro-explanation. This is not to say that there is no place for micro-explanation. For some of the explanatory purposes that Abell et al. discuss there is indeed a need for micro-explanation. Micro-explanations and macro-explanations might complement rather than rival each other. If routines really have the strong degree of robustness that often is attributed to them, this provides a good reason to prefer macro-explanation to micro-explanation of differential firm performance. At the same time, however, this does not obviate the need for a micro-explanation of when and why routines have a strong degree of robustness. Contrary to what Abell et al. argue, macro-explanations need not be incomplete in the sense that they miss out on links in the complete causal chain that connect macro-phenomena with each other. Abell et al’s use of Coleman’s diagram to substantiate their claim that macro-explanations are necessarily incomplete is misguided. Once we appreciate that routines are macro-level mechanisms and that the inter-level relation between routines at the macro-level and the individual actions and interactions as their component parts at the micro-level is constitutive and not causal, we can see that Coleman’s diagram needs to be squared. And once we have done this, we can also see that not the “arrow 4 – explanations” (which directly connect macro-phenomena with each other) but “arrow 1 – explanations” (supposedly indicating downward causation) and “arrow 3 – explanation” (supposedly indicating upward causation) are (at best) convenient shorthands. “Arrow 4 – explanations” can be causally complete. True, routines are (partly) made up by individual actions and interactions and micro-explanations of routine firm behavior are more fine-grained and detailed than macro-explanations of firm behavior in terms of the firm’s routines. But the fact that macro-explanations are less detailed and more coarse-grained does not make them causally incomplete. Routines can only be called macro-level mechanisms if they display the requisite invariance and robustness over time. Only then can routines figure as explanantia in macro-explanations of differential firm behavior and firm performance. Such macro-explanations might then also be preferred to micro-explanations on the ground that such macro-explanations can provide a sort of contrastive information that micro-explanations cannot provide. Whether routines actually are invariant and robust over time is an empirical issue. If they are, there is still a need for micro-explanation. Only micro-explanation can help us understand better why stable and robust routines emerge and persist despite the fact that the individuals participating in the functioning of the routine have partly conflicting interests. Although Felin and Foss are not the only protagonists, I take them to be the main driving forces behind the microfoundations project. Felin and Foss explicitly link their project with reduction in science (Felin and Foss 2006, p. 25). Without any further argument or explication, Abell et al. equate collective with macro and individual with micro (cf. Abell et al. 2008, pp. 490–491). Henceforth, I shall not use ‘collective’ and ‘individual’ anymore. As a minimum. Abell et al. argue, the causal chain involves two subsequent steps: a macro-to-micro step and a micro-to-macro step. In this minimal causal scenario, arrows 1 and 2 are replaced by one diagonal arrow 1a. It can even be argued that on Abell et al. ’s own understanding of methodological individualism (which they describe as “… the explanation of firm-level (macro) phenomena in strategic management must ultimately be grounded in explanatory mechanisms that involve individual action and interaction”, Abell et al. 2008, p. 492), methodological individualism does not imply that mechanisms referred to in explanations of macro-phenomena should be described at the level of individual action and interaction. On this understanding, methodological individualism does not rule out explanations in which the mechanisms referred to are described at the macro-level as long as the working of the mechanism involves individual action and interaction in the constitutive (or componentionall) way to be elucidated below. Epiphenomenalism is the view that higher-level entities and their properties are causally impotent. Given that Coleman viewed macro-phenomena as abstractions of micro-phenomena rather than as ‘tangible’ phenomena (Coleman 1990, p. 12), it seems that Coleman himself did not interpret the arrow 1 relation as a species of downward causation. For Coleman, arrow 1 rather seems to have stood for how the physical and social situations individuals find themselves in causally affect the individuals’ behavior characteristics and interactions. Coleman also seemed to have thought that micro-explanations can be given of such processes (ibid, p. 20). One could also use ‘realization’ here to characterize the relation between ‘micro’ and ‘macro’: the micro-phenomena mechanistically realize the macro-phenomena (cf. Wilson and Craver and Bechtel 2007). See also Robinson’s (2005) ladder view for a similar view. Wimsatt (1994/2007) similarly argues that higher-level processes can be called mechanisms if they are dynamically autonomous, i.e. if they are relatively insensitive to changes in underlying processes. See also Glennan (2002). Note, though, that not even Nelson and Winter (1982) argue that all firm behavior is routine. In their view, ‘routine’ refers to that part of firm behavior that is repetitive, regular and predictable. Part of firm behavior, for example innovative behavior, is unpredictable and hence non-routine in their view. Abell et al. (2008) recognize that routines might be robust to this strong degree. Another reason that Abell et al. give for why micro-explanation should replace macro-explanation is that “the fundamental mandate” of strategic management is to enable managers to gain and sustain competitive advantage (Abell et al. 2008, p. 492). To achieve this, managerial intervention is needed, which according to Abell et al. can only take place at the micro-level. This introduces a host of issues that cannot be satisfactorily addressed in this paper. Suffice it to say that whereas “the fundamental mandate” presents a legitimate concern for the field of strategic management, this concern should not be mixed up with philosophical issues concerning explanation and causation.